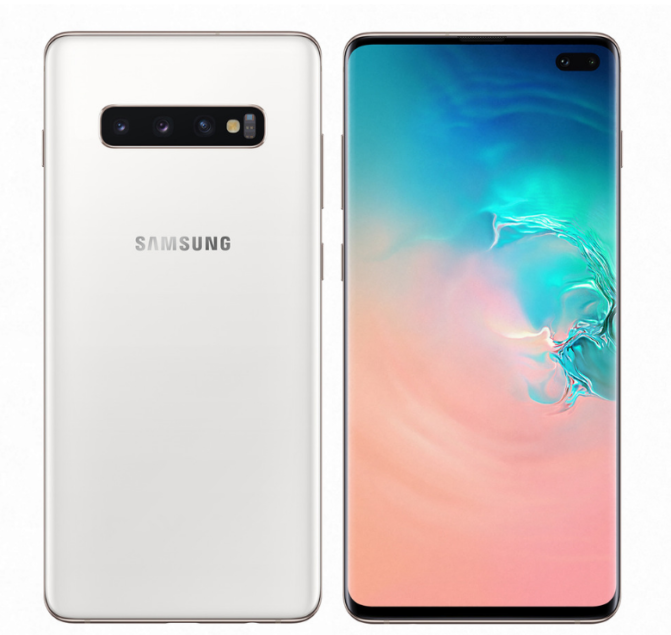 Splashing your cash on a high-end, premium smartphone such as Samsung’s Galaxy S10+ is probably not an everyday occurrence, indeed, like most of us you’ll probably be aiming to get a couple of years usage out of the phone before upgrading again. 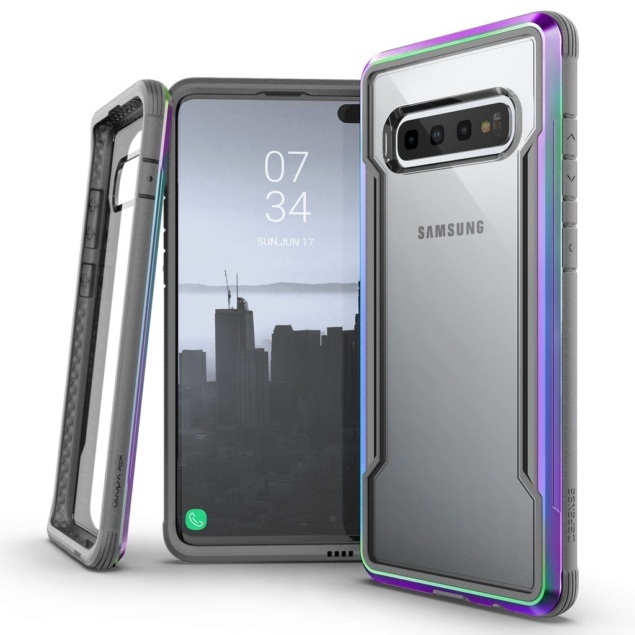 With its all-glass design, large Infinity-O display with its punch-hole (that you can customize) that houses the two selfie cameras, the Galaxy S10+ isn’t going to be cheap to repair, so you’ll probably want to slap a case on it to keep it in pristine condition for as long as possible unless you have money to burn. 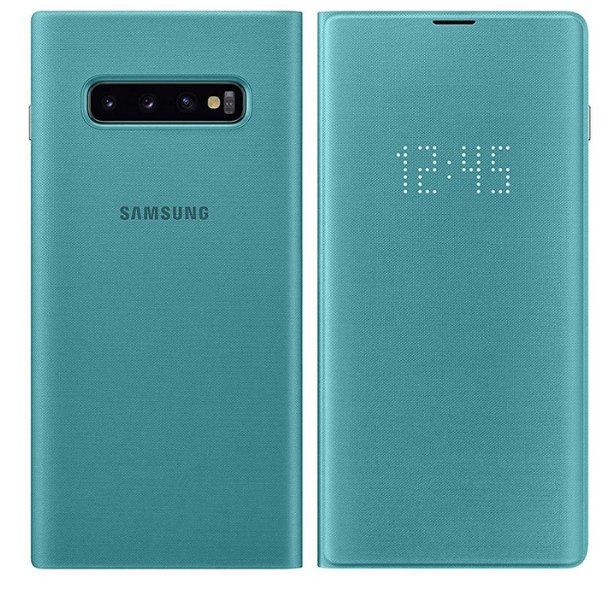 Kicking the list off is Samsung with its LED View case that features built-in LED lights that show the clock and notifications as well as the ability to store a bank card in the internal slot. 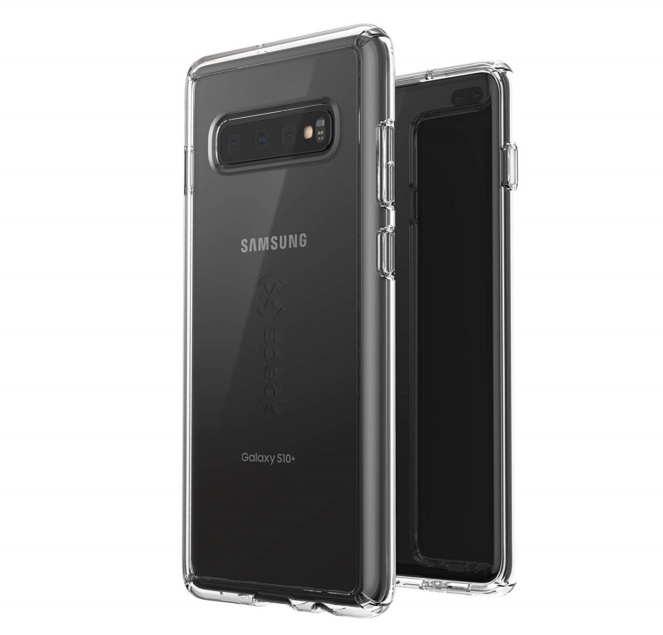 The dot matrix design allows for customizable notification designs while the case itself offers front and back protection for your Galaxy S10+. Available in Black, Green, or White, the LED View case can be ordered from Amazon for $59.92. 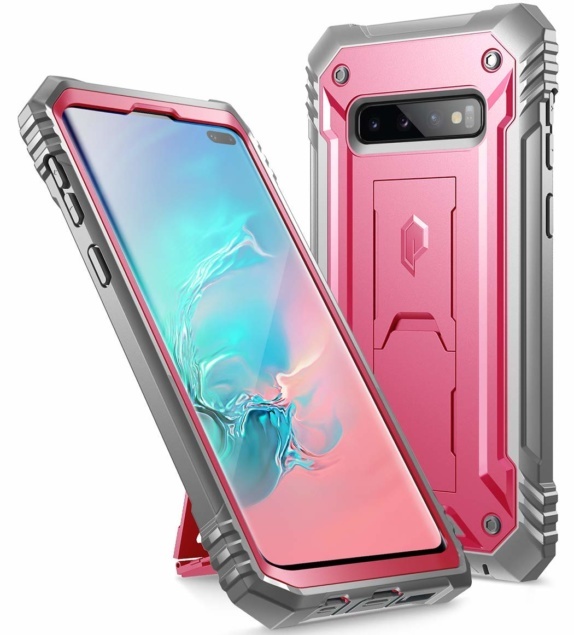 X-Doria’s Defense Shield case combines hard polycarbonate, flexible TPU, and anodized aluminum to provide military-grade drop protection (exceeding MIL-STD-810G) while the transparent rear panel ensures your choice color is displayed to all and sundry. 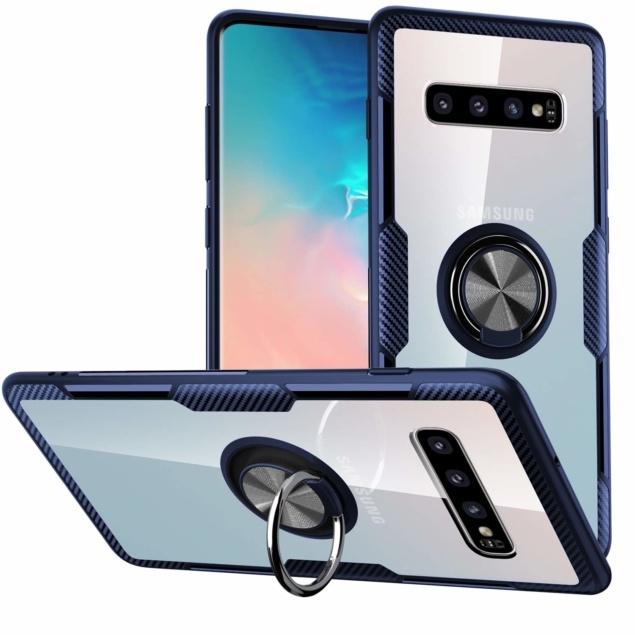 The phone’s display is protected on flat surfaces by the raised lip and there is an integrated sound channel that amplifies the bottom speaker, redirecting sound to the front of the case. You can grab X-Doria’s Defense Shield Case from Amazon in Red or Irridescent for $29.95. 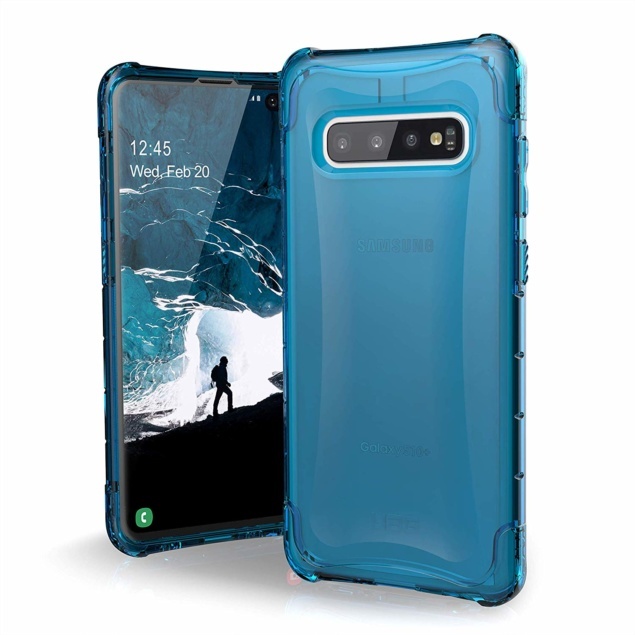 One of the arguments you hear against using a case is that it hides the design of the phone, but Speck’s GemShell Clear case you can show off your Galaxy S10+ to one and all while ensuring it’s protected against life’s knocks. The hard polycarbonate outer layer protects against scratches while the soft TPU inner absorbs the shock creat from drops and bumps. The GemShell case meets Mil-STD-810G drop-test standards and the raised bezel protects the display when the phone is laid face-down on flat surfaces. The Speck GemShell Clear case costs $27.60 from Amazon. 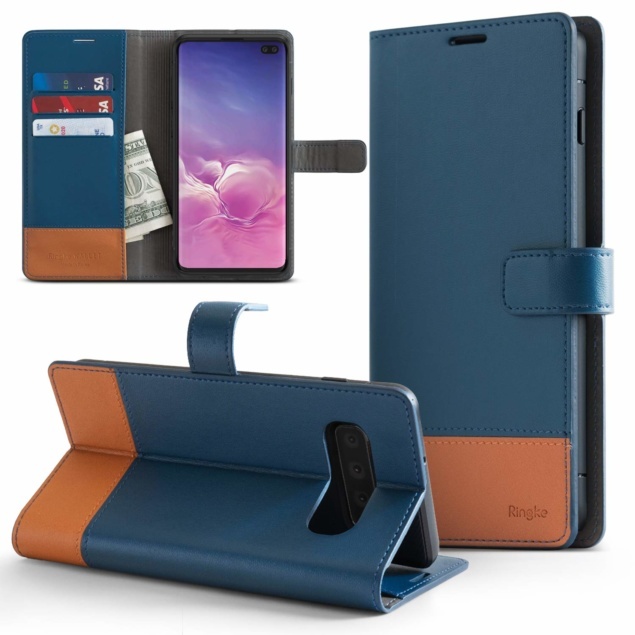 If you want your phone case to store your cash and bank cards, Ringke’s Wallet Case could be the case your Galaxy S10+ needs. It’s exterior is made from Premium PU Leather while the inner mount is constructed from flexible TPU material. You can store 2 cards in each of the three card slots and an internal side pocket where you can store bank notes, receipts, or even more cards. The case also has a built-in kickstand so you can enjoy hands-free viewing of your favorite content, and there is all-around protection for your phone. Available from Amazon for $12.99, you can get the Ringke Wallet Case in Navy Blue & Brown or Black & Red. 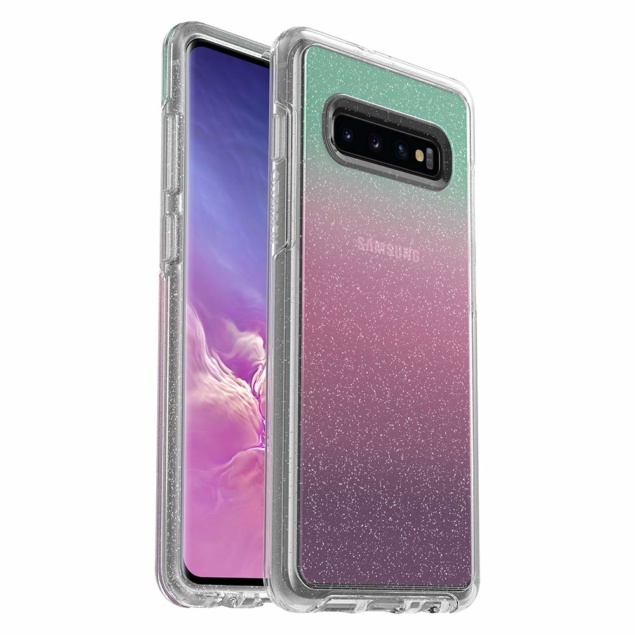 Adding some glitz to the Galaxy S10+ is OtterBox’s Symmetry Clear series of cases that features a pocket-friendly design with wraparound colors and more importantly, polycarbonate and TPU outer and inner layers of protection against bumps and scratches. The raised lip protects the display when it’s laid on a flat surface, and OtterBox offers a limited lifetime warranty on the case. The OtterBox Symmetry Clear case can be ordered from Amazon for $33.81 in the following designs – Aspen Gleam, Black, Clear, Gradient Energy, Ivy Meadow, Love Triangle, Stardust, and Tonic Violet. The Design Armor case from SQMCase features a 360-degree rotating ring that brings extra grip and the option to be used as a built-in kickstand. The transparent rear panel is scratch-resistant while the bumper is made of TPU and guards against bumps and knocks. It should be noted that the case is not compatible with wireless charging, but the metal ring on the rear can attach to magnetic car mounts when using the phone for navigation. Amazon is selling the Design Armor case for $10.89 in Black, Blue, and Red. Poetic’s Revolution case adds some heavy-duty protection into the mix as well as a colorful design and a built-in kickstand for hands-free viewing. The outer shell is made of scratch-resistant polycarbonate while the shock-absorbent bumper is made from a flexible TPU. There are raised lips and corners to keep your display safe when the phone is laid face down on a flat surface. Despite the heavy-duty protection, the case is still compatible with wireless charging. Available in Pink, Blue, and Black, Poetic’s Revolution case can be ordered from Amazon for $16.95. 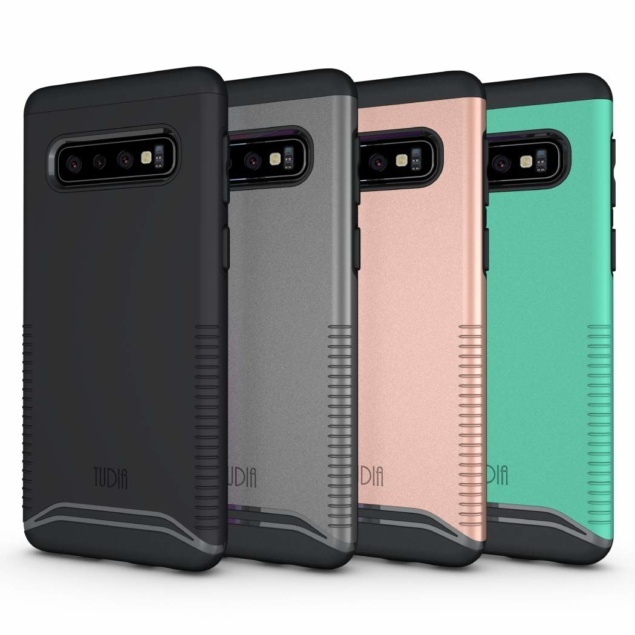 Despite being the cheapest case in the list, Tudia’s Slim-Fit case offers dual-layer protection, a snap-on design, and maintains the slim profile of your Galaxy S10+. The TPU inner layer absorbs shock from bumps and knocks while the polycarbonate outer shell protects against scratches, and the case is compatible with wireless charging. When laid face-down on a flat surface, the raise lips prevent the display from being harmed. The Slim-Fit case from Tudia is available in Matte Black, Metallic Slate, Mint, and Rose Gold for $7.50 from Amazon. Featuring a feather-light design, the Plyo case from UAG has an impact-resistant inner core along with air-soft corners and military-grade drop protection. The phone’s buttons are protected by tactile covers that deliver a clean click-feel and the case itself maintains compatibility with wireless charging and reverse wireless charging. Available in Glacier or Ice colors, the Plyo case from UAG can be purchased from Amazon for $39.95. 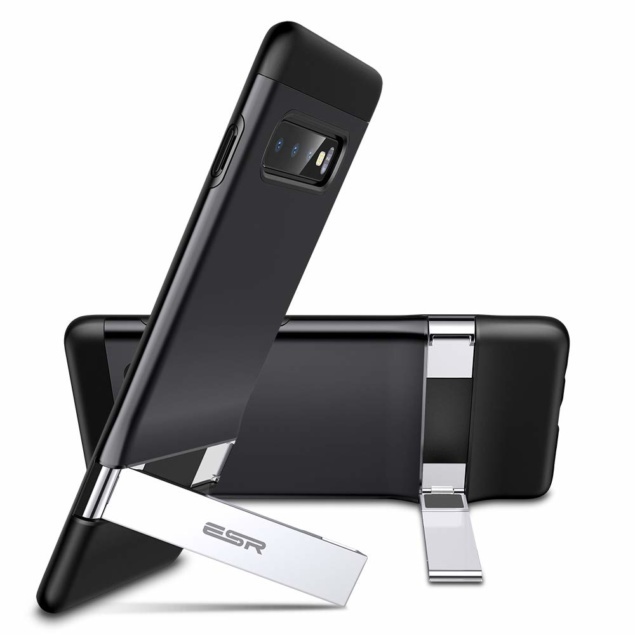 If you are after a slim case with a built-in kickstand, then perhaps the ESR Metal is the case you need. The case has a polycarbonate rear panel and a shock-absorbent TPU bump that provides military-grade drop protection while its built-in two-way kickstand allows the phone to be stood vertically or horizontally. Its raised lips guard the phone’s display when it’s laid on a flat surface and the rear camera is similarly protected. Available only in Black, the ESR Metal case costs $21.99 from Amazon.